Our two best sellers! Try one of each for the Holiday party or just to sample on your own! Two 1 1/4 lb. 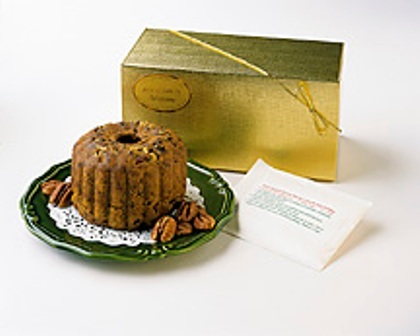 puddings - 1 Walnut Rum cake made with rum and brandy and 1 Pecan Bourbon cake made with praline liqueur and bourbon. Sauce recipes included. This is a great hostess gift or just the right size to sample on your own. Try them cold or heated - they're delicious either way. Approx. weight 2 1/2 lbs.